Over the last two weeks, there has been much noise within the industry over the credibility of honest grading from one of the franchises of the diamond grading laboratory EGL (European Gemmological Laboratory ) which has impacted on retail, the end of the Jewellery supply chain. This relates to EGL certified diamonds. The CEO of Rapnet, a universal trading platform for diamonds which provides a valuable source for diamond brokers, has taken a stance and has refused to play host to all EGL certificated diamonds uploaded by diamond cutters and wholesalers. The reasoning is that one of the franchises, EGLI (European Gemmological Laboratory International) has been subject to criticism over the last few years for over zealous diamond grading. EGLI have been accused of using the Gemmological Institute of America (GIA) terminology to describe diamonds as four or more colour/clarity combination grades higher than what the GIA would have given to the same diamonds. The impact of this practice has facilitated a profit motive for retailers to sell for example an EGL certificated E/VS1 diamond to consumers at a similar price or more economical price than a G/SI1 GIA certificated diamond. The president of the World Federation of Diamond Bourses (WFDB) has argued that this unethical standard of trading by retailers and the acceptance and support of a culture that promotes misrepresentation of diamond quality and the outright cheating of consumers destroys the diamond trade from within. The elimination of this practice should be addressed and any members of Bourses that participate in this fraud will be answerable and may be expelled. As a member of the WFDB, I have always promoted the exacting standards of diamond certification by GIA and believe their grading standards has a set a benchmark for other laboratories to follow suit, although some may have differing nomenclature. The GIA created its gemmological standards and related terminology in 1953 and issued diamond grading reports in 1955. GIA has continuously and consistently supported its standards by issuing grading reports for millions of diamonds. in Antwerp and IGI (International Gemmological Institute.) The latter is franchised around the world and in the USA, the AGS (American Gemmological Society) offers exacting standards for diamond grading reports and would not hesitate in recommending all these laboratories . So anyone embarking on a journey to find the ideal diamond for yourself or your partner please be aware of retailers selling diamonds at very attractive prices on lesser known laboratory certificates. Make sure your EGL certified diamond is a credible one. Do spend the time, exercise due diligence and really consider the benefits of buying a diamond on a credible laboratory certificate. You will find the value will give you peace of mind and outweigh the difficulty of trying to resell or upgrade your lesser known laboratory certificated diamond at a later date. The 4C’s are a common standard in the diamond and jewellery industry representing Cut, Colour, Clarity and Carat weight. They were introduced by De Beers over 50 years ago to help consumers understand the value of a diamond. Cut is a term used twofold to either describe the shape of a diamond or the ideal proportions of a diamond. It is the only C influenced by hand as the other variables are governed by nature. There are varying shapes of cut of diamond including round brilliant, princess, asscher, emerald, heart, pear, oval, marquise, radiant and cushion. A diamond polisher’s challenge is to deliver from a rough diamond a polished diamond that offers maximum brilliance and fire reflected back to the viewer. To achieve this, a polisher has to adhere strictly to the ideal mathematical proportions of each shape which are applied to the three main components of a diamond, the crown, girdle and pavilion. 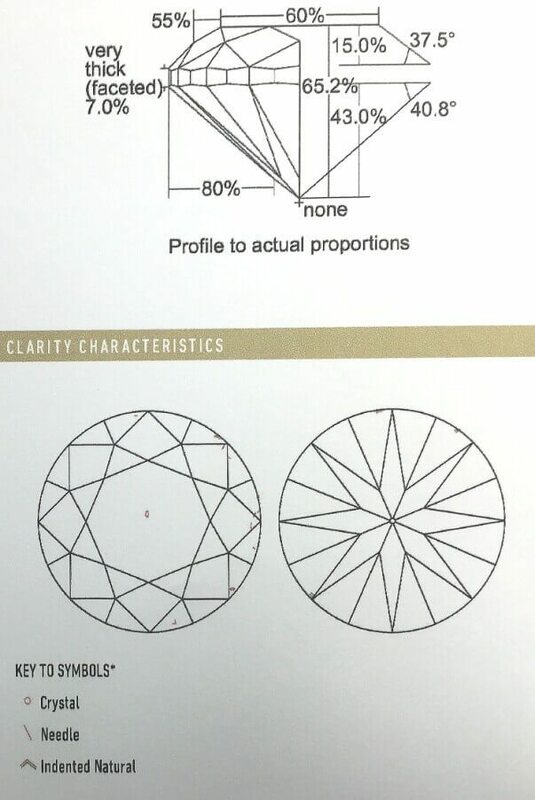 If a polisher adheres to the ideal proportions of a diamond shape an ideal cut grade will be issued and if there is deviation away from ideal proportions, a weaker cut grade will be issued from diamond grading laboratories. Colour is a term used to describe the subtle difference between the colourless grade of D-F to the near colourless and off white diamonds which then appear to draw a very slight tinge of yellow which increases to a more noticeable yellow at the end of colour scale. Grading of colour is performed under controlled lighting usually with a master diamond colour set for comparison to help accuracy in determining colour. When the intensity of colour in a diamond is stronger than in the scale above, a diamond may be given a ‘fancy colour’ grading. Fancy colour diamonds occur in shades of brown, black, yellow, orange, green, pink, blue and red. Fancy colour diamonds are increasingly sought after. Clarity is a term used to describe the presence of natural inclusions visible within a diamond which occured in the crystallisation growth of diamond. For purposes of grading clarity, a 10 x diamond loupe (magnifying glass) is used to determine clarity grade which can vary from Flawless to Included. Inclusions in a diamond may include cracks, fractures, carbon, clouds and natural growth lines. Diamond grading laboratories indicate the location of inclusions in a diamond which can vary from centre of the stone to the girdle. Carat is the measure of weight for diamonds and needs to be distinguished from the size of diamond, which is affected by cut and shape of the stone. There are 100 points to 1.00 carat which is equal to 1/5 of a gramme. If you hold colour and clarity constant and increase the carat weight of the diamond as per the illustration above, the price of the diamond increases dramatically. The 5th C is often used to refer to the Jeweller! Another subject in itself!